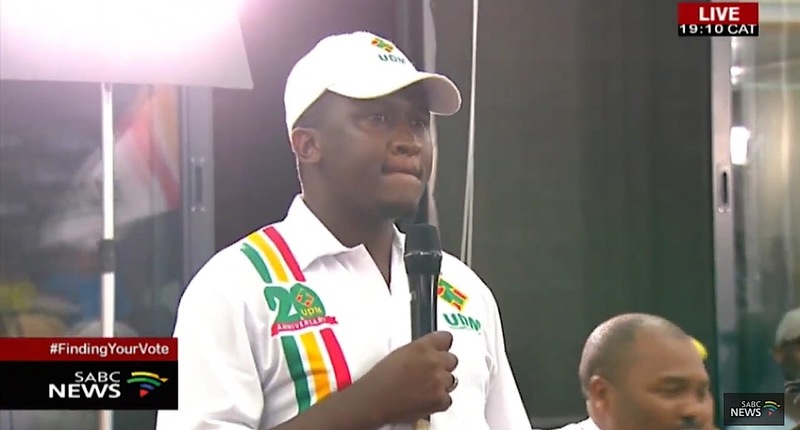 Yongama Ludwe – the United Democratic Movement (UDM)’s number 6 on the party’s parliamentary list – is also the Gauteng Provincial Youth Secretary. This is a sign he says that the party is embracing the youth. The Daily Vox team spoke to him about this and the party’s plans for the elections. The UDM is a small but growing party led by Bantu Holomisa. The party was formed in 1997. In the 2014 elections, they received 1% of the national vote. On the back of those results, they do not have any qualms about becoming the government in 2019. Their goal though is to have the UDM represented in every province and to double their representatives in the national assembly. “We are hoping that we disrupt the support base of the African National Congress (ANC) in terms of votes. If the ANC gets less than 50% of the vote then we will have a government of coalitions. That is what the UDM has been preaching and preparing South Africans for,” said Ludwe. If any party wants to constitute the national government with the help of the UDM, they will do so with a condition: the deputy president must be from the UDM. Ludwe says his party think coalitions are the way forward for South African politics. As for who their possible partners are going to be, UDM haven’t decided as yet. In all likelihood, Ludwe says it’s going to be on a case-by-case basis. Their manifesto will be their guide in the choosing of partners. One particular issue which they apparently will not budge on is fighting corruption for people to get service delivery. “We have a zero tolerance policy on corruption, and putting communities first. I believe our national leadership will go with that person,” Ludwe said. According to Ludwe, the party has a zero tolerance policy on gender-based violence (GBV). He says it’s started in their internal structures by having a gender officer. “We have the stance that says if you are found to be guilty of killing a woman or abusing a child there should be no bail or parole. If you have taken the life of a child or woman then you have ceased your rights as a perpetrator,” Ludwe said. The criminal justice system is too lenient on perpetrators says Ludwe adding: “If it comes to a push we say bring back the hanging of people for such things.” The UDM does not think it’s right that South Africa is in the top 10 of countries with the worst GBV and yet South Africa has been reputed as having such a good constitution. They want to reality to better reflect the constitution. During the parliamentary vote for the amendment of section 25 of the constitution to allow for land redistribution with compensation Ludwe says the UDM supported the amendment. However, the party has many questions which they have been raising. “We are calling for an economic indaba. As a party we believe if we sit at the table as political parties, faith-based organisations, NGOs, and business and community leaders we can table what we want to see,” Ludwe said. The question the party want answered is who will be affected and how, how will food security and economic stability be affected and what are the consequences. Ludwe says the party thinks the people of South Africa must be allowed to provide the solutions to the land issue. “We need to engage people. The answers lie with the people. We are busy with rhetoric and divise statements but on the ground people want to live in a peaceful South Africa,” he said. Ludwe echoed the sentiments of many students around the country saying that free education is not happening for students. “We see Naledi Pandor said funds are made available to pay the historic debts. That is an electioneering tool,” Ludwe said questioning where the money to pay for the debt came from. The UDM’s solution to funding free education: cut down on government spending, the number of government departments, and the state-owned enterprises. Ludwe says if those actions are done billions of rands can be channeled to free education. As for attracting young people to the party Ludwe says they have young people on the ground from the party. “We are grooming young leaders to take over the leadership of the party. There is a generation of young people being raised by the general,” Ludwe said. The UDM is the party grooming leaders who will take South Africa forward says Ludwe.” We are saying South Africa first and then the UDM after. Unlike other parties who will put their parties before South Africa forgetting that they are a part of South Africa.” Ludwe said.